As part of our commitment to providing outstanding service, we recently sent out surveys to both clients and to our live-in carers. We are delighted to report the feedback has been excellent! 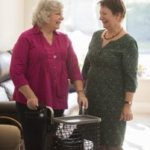 Clients have complimented us on how well and often we communicate with them and one live-in carer said, ‘Best care company I have worked for.’ We are extremely proud to work with all our live-in carers, clients and families and will continue to provide the best care possible.